And in an article in latest issue of Global Policy the Hungarian political scientist and political economist Béla Greskovits has now offered precisely this. The problems of CEE democracies, he argues, can be seen as a varying mix of backsliding – understood as a turn to illiberal and authoritarian practices by rulers and the radicalisation (and extremist voting patterns) of sections of the electorate – and hollowing, by which he understands public disengagement from politics, the atrophying of civil society (including organised economic interests) and decline of trust in elected politicians. While backsliding (distantly) echoes Putin-esque authoritarian subversion of democratic institutions in the East, the hollowing out of democratic politics, he suggests, is a local version of long-term trends seen in many established Western democracies. Except, as Greskovits notes, in CEE, it is less a matter of the hollowing and decline of traditional mass politics, than of their being ‘born hollow’ and never been filled out in the first place. Measuring backsliding and hollowing using a basket of indicators, Greskovits finds distinct patterns of hollowing and backsliding. Hungary, unsurprisingly, represents a case of extreme backsliding, but one that takes place in the context of relatively well rooted parties and a relatively solid civil society. Here, it seems, it was the strength of parties and society that has facilitated the authoritarian backsliding, as can perhaps been seen the well-organised and well-mobilised nature of both the ruling party and its dynamic far-right challenger Jobbik. Both seem the ability of both to put down roots in and colonise parts of civil society, a pattern already, as Sheri Berman argued , seen in classic, if more extreme form, in Weimar Germany, although now extending to youth and pop culture. 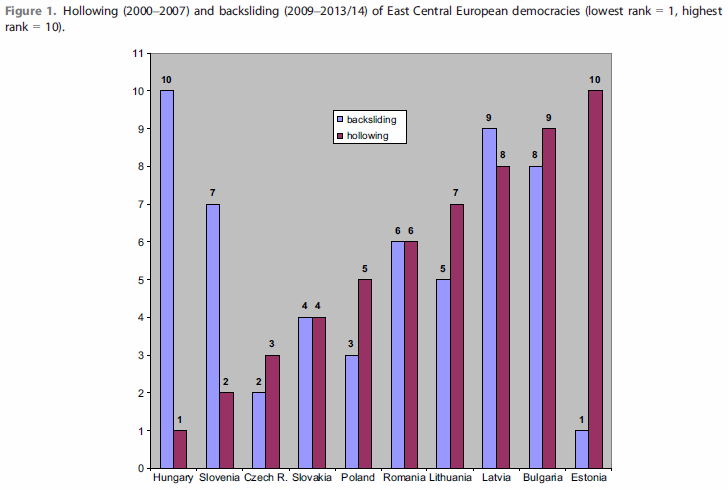 Latvia, Bulgaria and Romania represent further cases of backsliding, but – Greskovits finds – these are socially and politically hollower democracies, perhaps explaining differences in their political trajectories. At the opposite pole to Hungary, we find Estonia and Lithuania, which appear as hollow democracies which have experienced little backsliding. This raises the same question, but in opposite form: could the elite-centred hollowness of their political systems in some way protected them from authoritarian drift? But Hungary aside, the other three Visegrad states (Czech Republic, Slovakia and Poland) do well, appearing in the familiar role as most successful and resilient democracies in the region: they are least hollow in terms of participation and civil society and have undergone no substantial authoritarian backsliding. Like all path-breaking work Greskovits’s article raises more many more questions than it answers. Slovenia, for example, appears, perhaps, oddly in the same category as Hungary: a case of backsliding of a socially and politically solid (‘low hollowness’) democracy, but it politics seems characterised by fragmentation and volatility. To some extent, this may reflect the indicators used: the indexes used are rankings of average rankings and the backsliding index includes the scope and scale of anti-austerity protests which, given powerful trade union and interest groups and the crunching impact of the Great Recession in Slovenia, were large could drag the country down . However, a closer look at the other backsliding sub-indices does show backward movement in Slovenia since 2009 in areas such as voice, accountability and freedom of the press. Drilling down, the difference seems to be one of degree: put somewhat differently, it is truly striking just how far and how fast and how consistently Hungary has moved back compared to other backsliders. Backsliding has generally been mild and indeed Romania and Bulgaria seem to be backsliders mainly in the sense that they have failed to overcome dismally low pre-Recession levels of democracy, rather than because of post-crisis deterioration. Hungary is the great exception. Here, as the detailed concluding discussion on Hungary and Latvia – two of the most badly Recession-hit backslider – makes clear, it is the nature of Hungarian right and right-wing elites that make the difference, as well as perhaps the majoritarian nature of Hungary’s democratic institutions, especially the strong first-past-the-post element in its electoral system. Drilling down still further, we a see a still more complex in the relation to hollowness. The relative solidity of Poland’s democracy, for example, seems to be rooted indicators for civil society (including trust in the Church), but (as measured by membership; levels of electoral turnout during the good pre-crisis years of 2000-7) its party politics are woefully hollow. Conversely, the hollowness of democracy in Romania and Bulgarian (as measured in the same period) stems from extrenely weak civil society indicators, although Romania (where religious bodies are the most trusted in Europe and (until 2011) binding national wage agreements existed) does better than Bulgaria. However, here we may wonder whether healthy looking levels party membership and mid-level turnout are partly an expression patronage politics and clientelism (although, if they are, some might see this as low grade form of democratic linkage rather than hollowness). Pulling together the indicators to look at the patterns more closely, I struggled to replicate the Global Policy rankings for some of less clear cut case, especially in terms of hollowness. Estonia’s relatively high levels of party membership, turnout and trust in NGOs, for example, should not mark it out as the hollowest democracy in CEE, even if neo-liberal economics and weakness of organised religion pull in that direction. A similar pattern is also present, although to a lesser extent in Latvia putting it closer to the low hollowness/high backsliding pattern seen in Hungarian case, even if ethnic division and proportional institutions have held back the conservative nationalist bloc more than in Hungary. 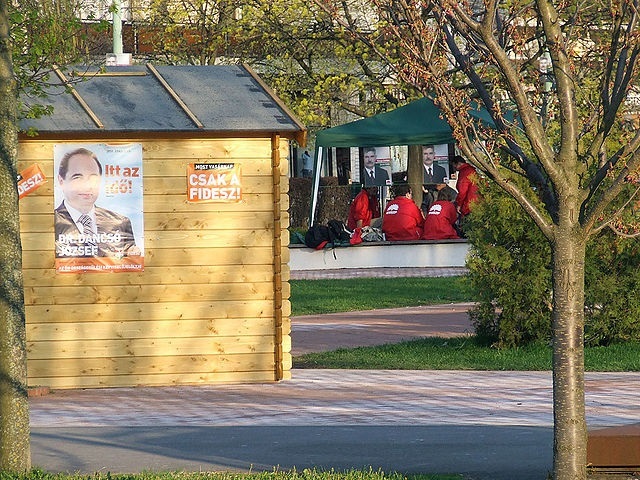 The Harmony Centre party in Latvia (heavily backed by Russophone voters) also seems a more embedded left party than the Hungarian Socialists, who came unstuck in 2010. And the Czech Republic – whether approached by ranking average rankings or (as above) loosely categorising indicators as high, medium or low and pooling these –appears considerably more hollowed out than Global Policy article finds. This seems due to rather anaemic civil society indicators (diminished trade unions, low support for organised religion and a relatively weak (if highly trusted) NGO sector) The latter may be a legacy of the Klaus and Zeman years). Such divergences are, however, unsurprising. For reasons of space the article does not give down-to-the-last-detail about how different sub-indicators have been bundled together and, as Greskovits himself points out, ranking, while it offers a quick and convenient first cut on comparative democratic decline will inevitably blur some of the subtler differences between cases. Even allowing for this, however, the question of democratic hollowness – and its relationship with more authoritarian and headline grabbing backsliding tendencies- seems emerge as a key phenomenon, which depending on the circumstances, may either help sink or safeguard CEE’s post-accession, post-Recession democracy. « Havel: For young radicals or middle aged and middle of the road?